Ellen Dissanayake (1995) famously suggested that art is the act of “making special.” From that standpoint, I cannot be more satisfied with our family’s crafty Christmas this year. Folks were making things around here for a week and it was wonderful. (Read more about it.) I was proud as a mother. I was engaged as an art educator, facilitating as much as seemed necessary to keep Santa’s workshop operating at maximum velocity. Makes me wish, for the first time in my entire life, that it could be Christmas everyday. Dan stole my heart by proving, once again, that he is an artist through and through. 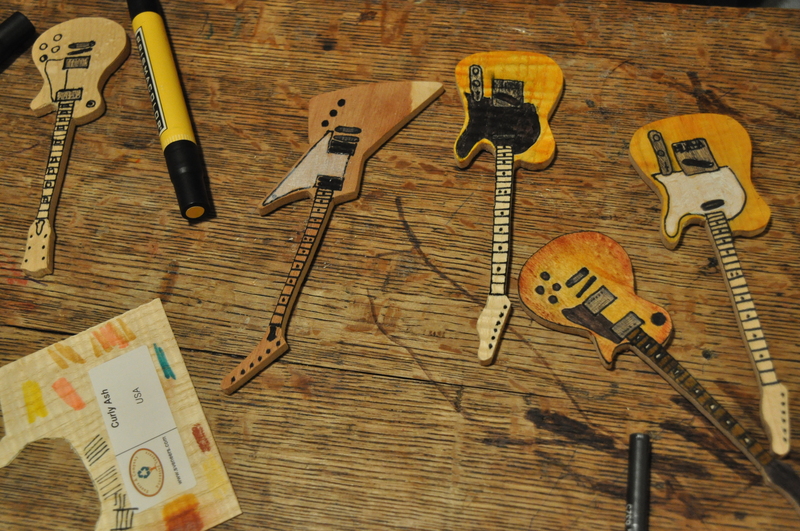 Vintage guitars on wood veneer with freehand drawn detailing. 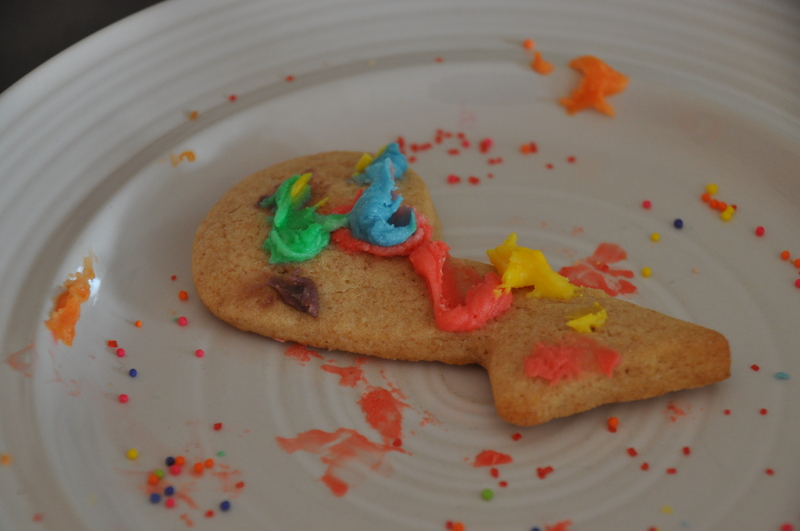 Some folks limit their icing color palette for the holidays. We don’t get that. 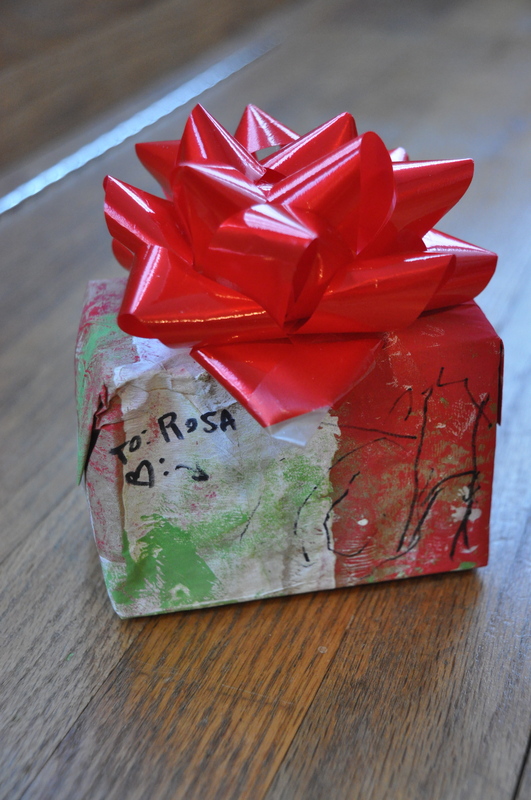 Cora-crafted wrapping paper with her personal signature. The contents of the box. 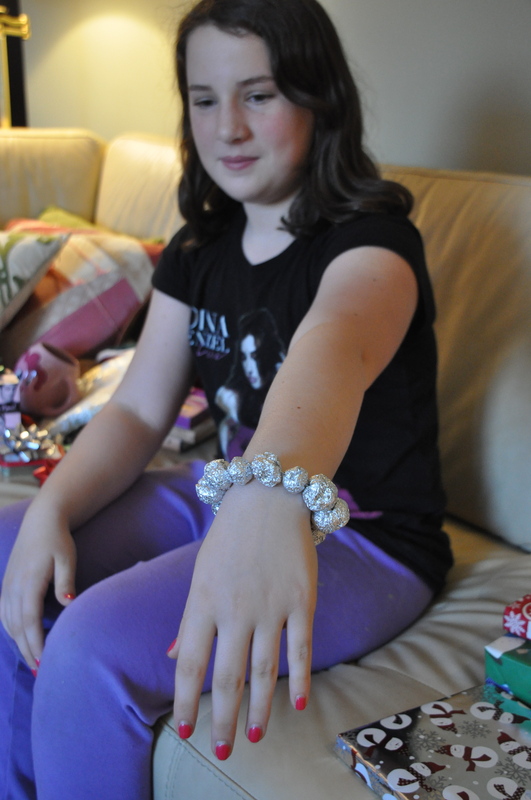 Aluminum foil bead bracelet, from Kid Made Modern. Our third (or fourth??) annual handmade gift exchange for adults in the family rocked. (back to front) Charley Harper inspired sandpaper paintings, wood box, fudge, oil painting of a cow on a slice of wood, guitar magnets, reusable snacks sacks and sandwich wrap, handkerchiefs embroidered with internal organs. While I was griping about, what I consider, inappropriate cultural appropriations of Christmas crafting a few weeks ago, I’m now fully engaged in making things to decorate our tree and give as gifts. I am wrestling with what to call this tree, what to call this holiday. There’s no Christ in our Christmas. There are cookies, and crafts, twinkly lights and lots of presents. As far as I understand, all that predated Jesus. So, maybe I can celebrate this season without feeling too much Jewish guilt. While I try to figure all that out in my mind, I’m keeping my hands busy making stuff. Most of my crafting supplies have been in storage since our kitchen project began last spring and I lost my office space, and I am eager to have them around again. I’m grateful for the parameters Christmas traditions provide for making things. Since I am out of practice, it’s nice to have guidelines for getting back in the swing of things, with plenty of leeway for improvisation. Tasks like making ornaments, cookies, and secret santa gifts offer a jump start; the supplies I have on hand lend a challenge to make the best out of what is before me. This truly is sacred time. Time I catch up on This American Life and the chick flicks in my netflix cue. 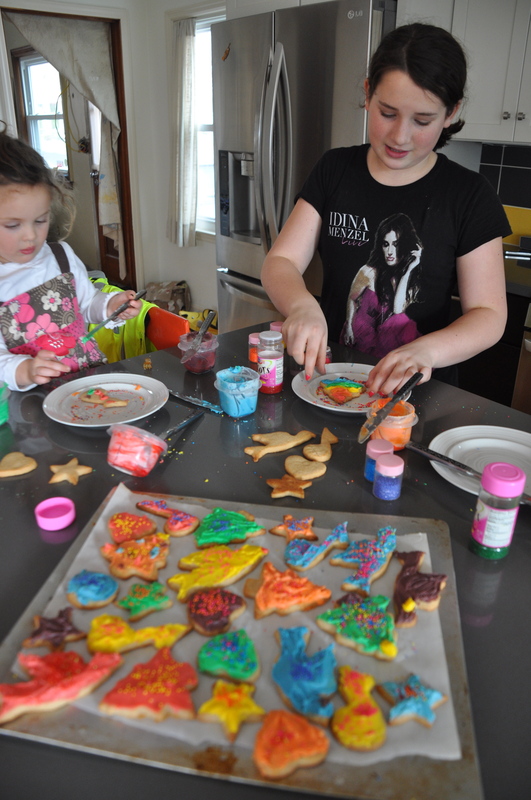 Time to spend time with the kids around the table with hot glue guns and glitter. Time to rejoice in all things handmade: edible, wearable, and all things in between. Please see the follow-up to this post Our Craftiest Christmas to Date. 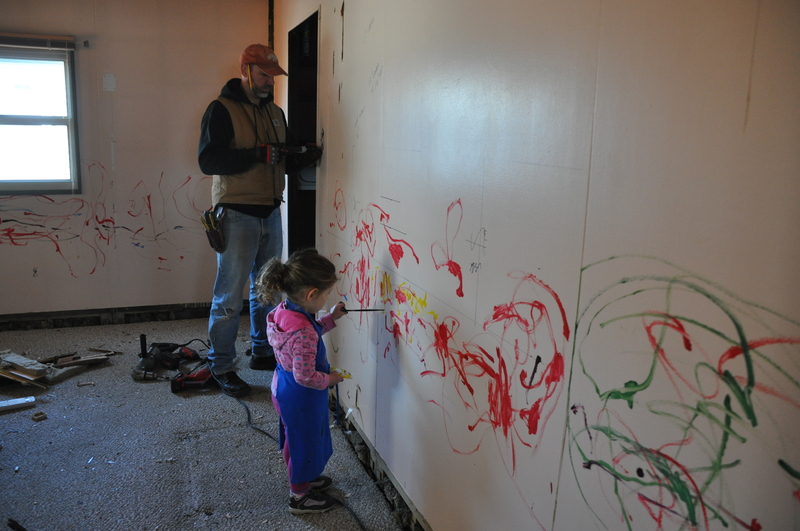 Lots of museums have creative play spaces primarily intended for families with young children. 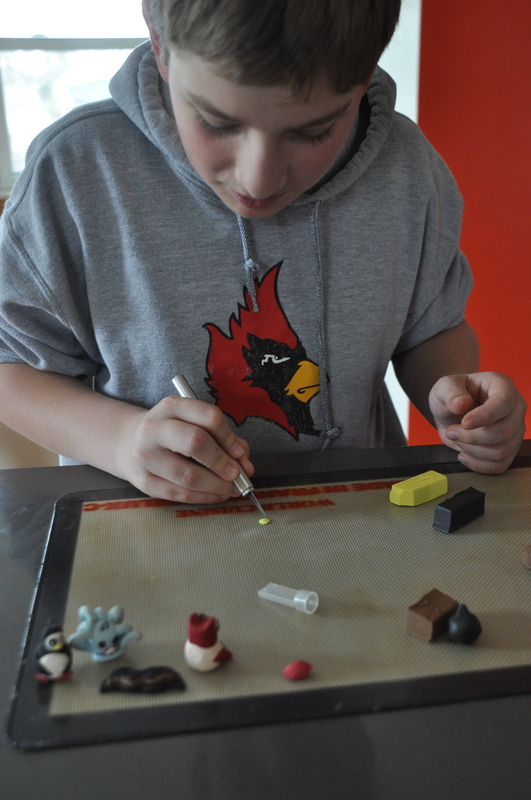 While the Columbus Museum of Art’s Center for Creativity’s Wonder Room was designed with children 3 years of age and older (and their families) in mind, it serves as a place for visitors of all ages to engage in creative play amidst original works of art. In its first iteration, the Wonder Room included the chance to create giant faces with magnetized household items, make constructions with sticks and rubber bands or plastic dinnerware, build a fort, and more. Our family and friends had a lot of good experiences exploring and experimenting in this room together over the past few years. But, I was happy to hear it was closing for an overhaul this Fall. We were ready for something new. So it was with bells on that Rosa, Cora, and I went to the members only opening of the new Wonder Room this past Sunday. We had a great time exploring the new space and hanging out with some of the artists whose work is included. But, we’ll need to return a few times before we determine how it will best suit our needs. While the old space was a bit of an all-over design, the new room was designed around the idea of an enchanted forest. Anyone who has ever read The Wizard of Oz, Little Red Riding Hood, or The Lord of the Rings know that enchanted forests aren’t always happy places. The components work well in conveying this idea and presenting lots of great art from the museum’s collection, but I must admit that some aspects caught Cora off-guard and will take her time to get used to. The space feels, overall, darker than it was. In addition, many of the activities seem better suited for older visitors, like Rosa, than in the previous incarnation. For instance, Heidi Kambitsch, a local artist known for her Openheart Creatures, created capes and masks and wings and claws for dress-up. They are inspired and engaging, and a little creepy. Rosa loved wearing them but it took Cora some time to warm to the idea of dressing up as a hairy wild beast rather than a pretty princess. Kambitsch’s work is positioned beside Alex Andre’s Metamorphosis Project which invites viewers to position themselves on either side of a revolving wheel alternately made of mirror and glass. As the wheel spins, the viewers see flashing images of themselves – check out the videos on the link, it’s hard to explain. All I can say is, interacting with Andre’s work while wearing Kambtisch’s costumes is a trip. Whether its good or bad is all based on your perspective. On a different note, the environmentalist in me will have to think more about some of the activities that use consumable materials. One of the things I LOVED about the first Wonder Room was the way it presented opportunities to engage in process art without producing waste. As I wrote in my review of Oliver Herring’s TASK, I have trouble fully engaging activities that create lots of trash; part of my mind gets lost in the landfill. Time will tell if visitors can create nests and niches that seem (to me) worthy of the materials they are made with. In the meantime, we’ll be heading back to the museum again soon to play with sticks and stones and cardboard squares. Hope to see some of you there! If you are still looking for holiday gifts, one of these books might be just what you need. All are filled with fantastic illustrations and imaginative writing, all set in wintery weather, all were recently released, and all are Cora-approved. Please Bring Balloons (Ward, 2013) is a magical adventure that begins and ends with a polar bear on a carousel. I’m a sucker for upcycled materials, and Ward reuses various papers to add both visual and conceptual depth to her illustrations. This story invites one to suspend reality for a moment, something we can all use from time to time. 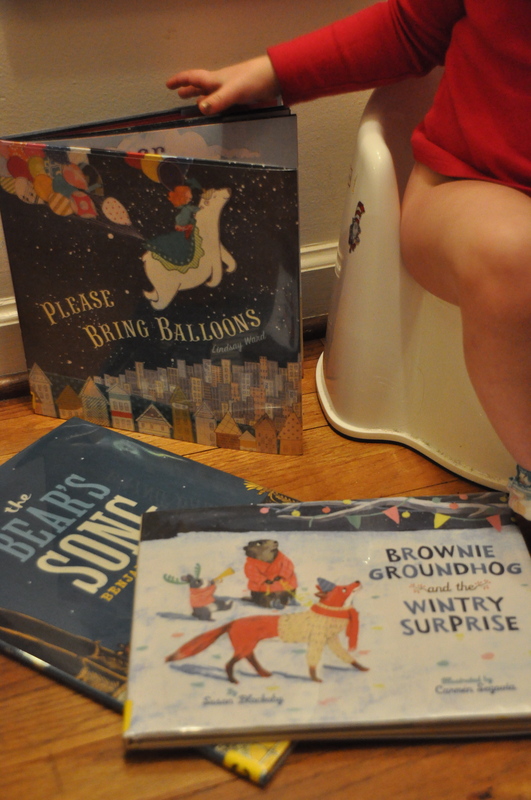 Brownie Groundhog and the Wintry Surprise (Balckaby & Segovia, 2013) is a great winter solstice story. The illustrations are rich and lusciously painted, the characters friendly and amusing. I like the way this book presents winter traditions typically associated with Christmas like twinkly lights and baking without doing so. In that way it seems to pay homage to the pagan roots of those traditions, responses to our human need for warmth and light in the coldest, darkest part of the year. The Bear’s Song (Chaud, 2013) is also wonderful to look at and tells a sweet story. The imagery is dense and will keep readers of all ages engaged for awhile. The story will resonate with anyone who has ever felt like a fish out of water and found solace with a loved one and a sweet treat. Odd as it seems since I teach art education for a living, I rarely write about “work work” in this space. I enjoy teaching and there’s a lot I could write about it, some of which I have, particularly the online aspects which so many of us educators are adjusting to these days. I guess I generally just like to think of this as a space to explore other things, my own ideas and interests, rather than my students’. The past few days, however, I have been taking time to stop and smell the professional roses; to honor the students I’ve been working with this fall on their culminating projects. Students in the Master of Art in Art Education program at the University of Florida can design their final projects to be pretty much anything they can imagine, so long as it is doable. The topics are as diverse as our students. They pull me outside the lines into new intellectual and creative territories that I really didn’t recognize until now. I’m grateful for their direction.These projects were all critical, meaningful, and transformative for the student/researchers. My hope is that some of them my prove inspiring to you too. An art teacher from southern Alabama examined his teaching practice in his very particular Southern, Black, and overwhelmingly poor school community. Jason is a self-described “privileged white man” who graduated from the same high school where he is currently teaching. Through self-study, he discovered that in order to reach his students in meaningful ways, he needs to attend to his manner and modes of communicating with them, as individuals, within a specific cultural context. 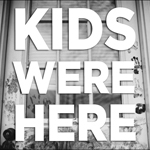 Conducting this research required some difficult conversations about race and opportunity which bring to mind Jonathan Kozol’s work – in the field, in our committee meetings, and within his own mind. Jason reported his findings through an altered field journal that can be seen on his website. Hilary, a student from California confronted conflicting facets of her identity in MIrror Changed to Glass. Using expressive arts-based research she interrogated what it means to her to simultaneously be mother, artist, and lesbian. The resulting drawings are hauntingly beautiful, mythic, and engaging as art, not just research. Trish wondered what homeschooling families in Central Florida were doing in the name of art education. She visited with and interviewed three families, accompanying some to alternative settings for art education where they receive instruction. She wrote descriptive narratives contextualized in a discussion of how these cases compare to the kinds of critical comprehensive art curricula she’d learned about it the UF program. She shared her findings on the self-publishing site ISSUU. In the future, she hopes to develop her own art program for homeschoolers and has already started a Pinterest Board dedicated to “Contemporary Art Teacher-Approved Lessons for Homeschoolers.” I meet so many people homeschooling their children these days, have thought about homeschooling my daughter, and imagine ways I might play a role in that movement in my own region. I appreciate the background research Trish offered in this study. Ana conducted research that will form the foundation for a community-based art initiative in her New Jersey town. Through interviews and surveys of key stakeholders, she learned about the history of arts programming in her community and identified opportunities and challenges for future developments. Most exciting for me, were the low-cost projects she developed for drop-in participation at an arts festival and the public library, the latter remembering Super Storm Sandy one year later. Kelly has become a curriculum revisionist, leading her colleagues on a quest for a more comprehensive, contemporary art curriculum. An elementary art educator in Texas, Kelly surveyed her colleagues (members of her professional learning community), about their experiences engaging curricular reform through backward design. She plans to use this information to continue district-wide reform efforts and to help folk sin other areas interested in reform to make changes. She’s starting by submitting a version of her research paper for publication in a national art education journal. Daniela introduced students at the Montessori school where she works to critical visual culture through discussion and analysis of advertisements, documentary films, and artists who employ culture-jamming. While she didn’t get the results she had hoped for, she planted seeds in these kids minds that they may bear fruits later in their lives. Her research and curriculum ideas are published on her website. It’s no wonder I’m tired. I’ve been around the world and back with these students in the past few months. I’m glad we are all now settling in for a long winter’s rest. Note: References for this page will be updated once these papers have been published through the University of Florida.